National Park Service staff at Arlington House in Virginia are celebrating their good fortune of late, having received not one but two significant gifts from private donors. On Oct. 9, park rangers at the onetime home of the Custis and Lee families overlooking Arlington Cemetery unveiled for reporters a striking Civil War-era stereo-view photograph of the enslaved Lee family housekeeper Selina Gray. It’s the second known image of an identifiable person among the 63 slaves owned by Robert E. Lee, but it’s also important because Gray played a leading role in preserving artifacts from George Washington’s family when they were threatened with looting by occupying Union troops. The find illustrates the value of modern digital communications. Arlington House volunteer researcher Dean DeRosa, a specialist in vintage photography, discovered a Briton was selling the photo on eBay. The opening bid? $20. The final sale price? $700, which the Park Service was able to come up with thanks to a donation from the private nonprofit friends group Save Historic Arlington House. The second blessing is that the image—taken in front of the former slave quarters now used as exhibit space—will now be displayed more prominently in a much improved on-site historical context, Jenny Anzelmo-Sarles, a Park Service public affairs specialist, told Government Executive. 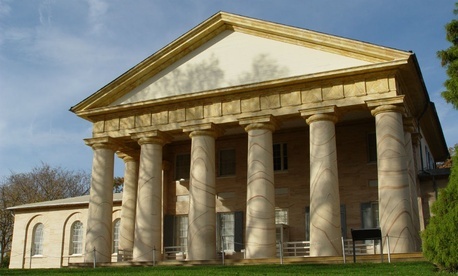 That’s because just three months ago, Arlington House benefited from a $12.35 million gift to the National Park Service Foundation from Washington mega-philanthropist David Rubenstein to restore the weakened structures of the mansion built in 1802 by George Washington Parke Custis. That donation, the Park Service noted in July, “complements President Obama’s Centennial Initiative for the 100th anniversary of the National Park Service in 2016."